The students of the MA Urban Design – Arts, City, Society and of the Masters 1 Architecture (Materiality field of study) of the École Nationale Supérieure d’Architecture de Lyon exchange their experiences in urbanistic and architectural projects with a special emphasis on the formal languages and discourses related to memory spaces. The purpose of this seminar, co-organized by sociologists from Centre Max Weber, is to reflect on the contemporary need to transform and interpret spaces and monuments that are considered historically conflictive, such as places of repression. The travelling seminar started in Barcelona with a tour to the slavery monuments of the city, and was followed by a Master class with the architect Julian Bonder, partner at the interdisciplinary firm Wodiczko-Bonder that designed the Mémorial de l’Abolition de l’Esclavage in Nantes and professor at the School of Architecture, Art and Historic Preservation of the Roger Williams University (USA). 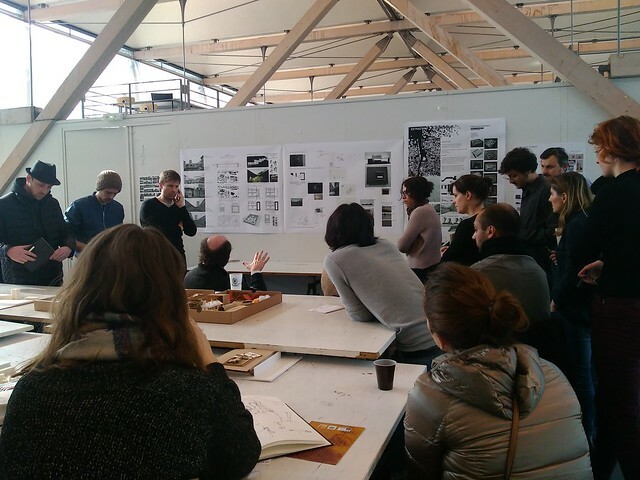 In Lyon, students took part in a two day workshop that included conferences with professors and architects as well as visits to memorial places of oppression, such as the Prison of Montluc. A discussion on the shaping of memory in public spaces under a gender perspective, addressing questions such as the gender gap in the public representation of collective memories , the different ways men and women are recalled in public memorial monuments as well as how gender is taken into account in contemporary democratic monuments. The architect’s role entails practicing an art of ethical and purposeful transformation, creating spaces that frame the human experience, and contribute to a better future. While we imagine projects and embark on journeys that leave traces over the skin of the Earth, our work often lies in unveiling, unearthing, uncovering as well as anchoring histories and memories in and onto territories, cities and sites. It is in the face of catastrophes, historic traumas, and human injustices that the architect’s (and the artist’s) roles become increasingly complex, problematic and, hopefully, necessary.This conference will present concepts, projects and works dealing with memory, history and trauma including the Memorial to the Abolition of Slavery, Nantes; the Center for Holocaust and Genocide Studies and various other projects in public space.